A perfectly curated vacation integrating wellness and the best of Croatian culture alongside an incredible group of humans. Escape your busy day-to-day life and remove any distractions so you can dive deeper into your personal practice and be inspired by growth. Connect to yourself and others who also value growth and be immersed in nature nestled by the sea. You'll be motivated to navigate towards your purpose and you will gain the tools needed for wholehearted embodied living and sustainable changes should you want to make them. As we adventure outward and bask in the culture and beauty of Croatia, you’ll feel compelled to venture inward, making space to slow down and listen to what you truly need. Enjoy an array of cherished rituals including island hopping, relaxing moments by the pool and soaking in some of the world's most beautiful beaches. Honest and real conversations, workshops and laughs until your belly hurts. Discover an ancient palace and dance to live music under the moonlight, enjoy world class seaside yoga classes, unwind over relaxing massages, walk through picturesque villages, hike to a 16th century monastery and savour beautiful locally sourced seasonal food prepared by our personal chef. If your Mediterranean fantasies feature tranquil days by sapphire waters in the shade of ancient walled towns, Croatia is the place to be. Out of Croatia's 1,244 islands, the island of Brac is especially unique. Brac, often referred to as the Pearl of the Adriatic, is the largest island in Central Dalmatia (the Croatian Coast) and one of the sunniest locations in Europe. The island is adorned with several serene villages with limestone architecture, hilltop vineyards, ancient olive groves and dramatic Adriatic landscapes of steep cliffs, crystal clear waters, and lush pine forests. Although Brac is famous for its radiant white limestone, used to build Diocletian’s Palace in Split, the island is most well-known for Zlatni Rat (Golden Horn), named one the Top 10 Most Beautiful Beaches in the World by Conde Nast Traveler. The beach extends like a "Golden Horn" into the Adriatic and has water framing two sides. The shape of the beach takes different forms depending on the wind. We will be staying on the southeast side of the island, near the seaside village of Sumartin and the hilltop village of Selca. Put your busy day-to-day life on pause and remove the distractions so you can dive deeper into your personal practice and be inspired by growth. Connect to yourself and others who also value growth and be immersed in nature nestled by the sea. You'll be motivated to navigate towards your purpose and you will gain the tools needed for wholehearted embodied living and sustainable changes should you want to make them. 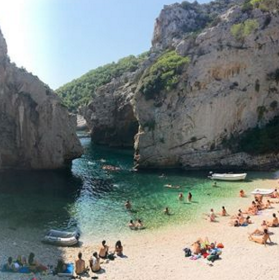 Adventure outward and bask in the culture and beauty of Croatia. As you do, you’ll feel compelled to venture inward, making space to slow down and listen to what you truly need. Enjoy an array of cherished rituals including island hopping, relaxing moments by the pool and soaking in some of the world's most beautiful beaches. Honest and real conversations, workshops and laughs until your belly hurts. Discover an ancient palace and dance to live music under the moonlight, enjoy world class seaside yoga classes, unwind over relaxing massages, walk through picturesque villages, hike to a 16th century monastery and savour beautiful locally sourced seasonal food prepared by our personal chef. The Yoga/movement sessions will also include conversations, journal activities, reflection and tangible tools to support living life in alignment physically, mentally, emotionally and spiritually. The goal is to connect you to YOU and to share a beautiful experience of lightness and fun with a global community. Meet incredible people who’s connection will continue to remain strong and grow over time and serves to elevate one another’s dreams and lives. These sessions are curated for all levels and needs, please do not ever feel like your practice needs to be perfect. TWICE-DAILY YOGA CLASSES LED BY JESS (LINK) Mornings will typically consist of an energizing flow, while evenings classes vary. Often times it's a chill/relaxing yoga class (more workshop style in format), and some other days we will integrate development, conversation, journalling, or coaching. It varies depending on the vibe of the group. HIKE TO 16th CENTURY BLACA MONASTERY (LINK) The hike will be followed by a magical swim in Blaca Bay and then we will take a picturesque boat ride along the southern side of Brac to Bol with views of Hvar. SHARED TRIPLE ROOM Individual bed in shared triple accommodation, en-suite bathroom with sea view soaking tub & shower. Floor to ceiling sliding glass doors open to sea view terrace. A true oasis for rest and relaxation, far away from the stresses of everyday life. 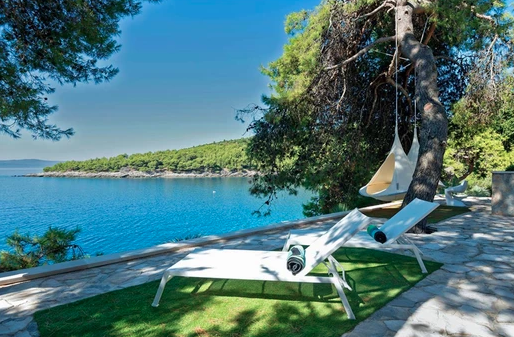 Villa Shiva is nestled along the Adriatic Sea and surrounded by fragrant pine trees. The villa has several terraces and magical areas perfect for decompressing. You will find several lounge areas and unique garden swings. This is the perfect place for relaxing while listening to the serene sound of the waves. Our home away from home has private sea access perfect for those epic feel good "jumping into the water" moments, an infinity pool perfect for lounging the afternoon away, an outdoor hot tub, sauna and plenty of areas for group gatherings as well as private space for self-reflection. For your convenience, we offer standard payment plans at checkout. If you need something customized to better suit your needs, please email us and include which accommodation you are interested in booking.